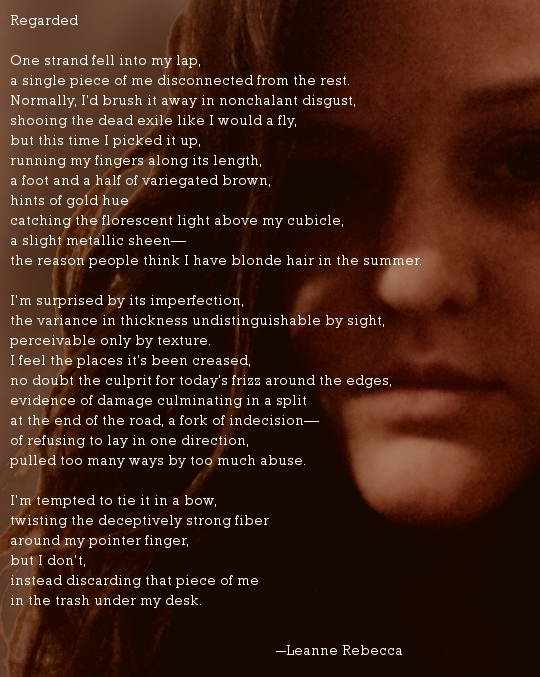 I never thought I’d be the type of poet that wrote about a strand of hair, about the seemingly unimportant details of a day, but something about that moment struck me. In its banality, it was beautiful and carried so much more meaning than I could have ever expected. How many interactions do we brush aside without pause. Maybe it’s dumb, but I seriously discovered some things about myself in examining my hair strand. What can you discover about yourself if you only take the opportunity to consider it? Like you said, it is not about the strand of hair but how your mind connects to so many ideas by simply looking at that strand of hair. I often stare at my hands and at that moment they become a reminder of a lifetime of experiences, how they can carry love, tenderness, anger and despair… Good write! Thank you! I think it says a lot that your hands carry so many experiences and that you take the time to reflect on them. Thanks for reading! It’s a good poem, and art should not just be about the big stuff. The beauty of poetry is that it makes us look at our lives, the world around us, and others in a fresh light, so that we comes to appreciate what we normally take for granted. I say “Bravo” for finding depth of meaning in a strand of hair. The microcosm reflects the macrocosm – nothing is too small to teach us what we need to know. Indeed. There’s so much we can learn from the details. Thanks for stopping by!